There are few occasions when I’ve been at a loss for words. This is not one of those occasions. Indeed, my problem now lies in deciding what words to use without forming an incoherent mass of babble. 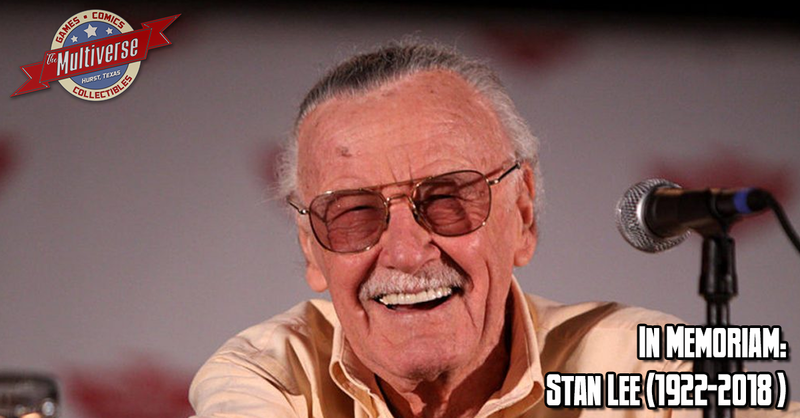 For how does one sum up the life of a man such as Stan Lee? I could write about the history of comics and Stan Lee’s place in it. Because to write about American comics without discussing Stan Lee is like talking about American history without mentioning Thomas Jefferson. For all the controversy Lee has inspired over his treatment of his artist collaborators and the debate over just how much of his public persona as a shameless self-promoter was an act, Lee had an undeniable influence on the American landscape beyond even the world of comic books. On that note, I could write about Lee’s status as a pitchman who could put P.T. Barnum to shame and how he made himself into the face of Marvel Comics. How many children of the 1980s still remember Lee’s bombastic voice-over introduction to every episode of Spider-Man and his Amazing Friends or The Incredible Hulk? And who could forget his many cameos in the Marvel Comics movies? I could write about Lee’s status as a writer from a writer’s perspective and his influence on the industry. How it was Lee (along with Jack Kirby) who hit upon the idea of writing superhero stories from a more realistic perspective, with characters who were not always perfect and superpowers that could be as much of a blessing as a curse. This led to the creation of The Fantastic Four, which would pave the way for other flawed heroes such as Iron Man, Daredevil and, of course, Spider-Man. I could also write about Stan Lee’s First Rule Of Comic Writing – write every story as if it were someone’s first comic, because it probably will be. For the sake of human interest, I could write about the man himself and his life outside of comics. How he was a Veteran who served during World War II, first in the Signal Corps where he repaired communications equipment, before being transferred into the Training Film Division, where he worked at writing training manuals, scripts for instructional short films and, yes, a few comics. (While he did this, he had the official military classification of playwright, despite not writing a single play.) I could also write about his romance with a model named Joan Boocock, and how they shared 70 wonderful years as husband and wife. Getting personal, I could tell stories of the many times I was lucky enough to see Stan Lee speak. I could talk about how I was there when Stan Lee was roasted at a New Years Eve convention in Dallas. I could also write about that brief span of seconds being rushed through an autograph line, where I simply said “Thank you for everything.” as he quickly scribbled his signature on a reprint of Amazing Fantasy #15. Perhaps all that is all that any of us who have ever read a comic book and dreamed can say? Thank you, Stan Lee. For everything.